As per the Comprehensive Transportation Study for HMA, sustainable transportation plans give emphasis for public transport and for transit oriented development. Prof CSRK Prasad, Head, Transportation division, Department of Civil Engineering , NIT, Warangal looks at the traffic scenario in Hyderabad. 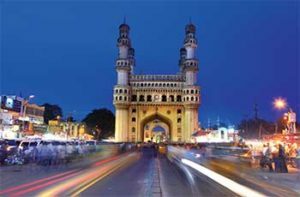 Hyderabad, the capital of the newly formed Telangana state, has evolved into a mega city over a period of 427 years from a small habitation constructed in 1591 on the banks of river Musi. 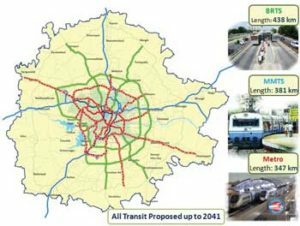 Today, Hyderabad Metropolitan Development Authority is planning different infrastructure projects including Transport of Hyderabad city as well as its surrounding areas spreading over 7100 square kilometers. The modal share of the city has been changed over time. The share of private modes like Two-Wheelers and Cars has gone up from 20 percent in 1988 to 40 percent in 2008. At the same time, the share of bicycle share was drastically reduced. Even though, the share of public transport remains same at 44 percent, it is much less than the recommend share of about 75 percent for creating sustainable transport conditions in the city. These modal shares have resulted into higher two-wheeler composition in traffic leading to regular traffic congestions. As per census in 2011, population and employment of Hyderabad Metropolitan Area are 9.6 million and 3.7 million with workforce population ratio (WFPR) of 0.38. 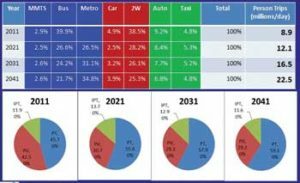 Four step travel demand models are developed for the horizon year and travel demand was fore-casted. Travel demand is expected to be 22.5 million trips per day with approximately 60 percent public transport share. 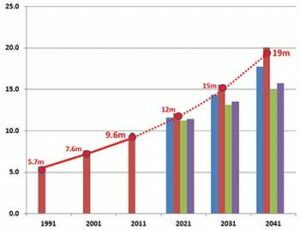 Public Transport share is expected to be approximately 72 percent in passenger-kms. This will ensure sustainable transport conditions in the city. National Urban Transport Policy (2014) of Ministry of Urban Development, Government of India has advocated for Transit Oriented Development in all million plus cities to achieve the following. In tune with this policy, it was proposed to establish TODs and TOGs along the existing outer ring road as well as along the proposed public transport corridors in HMA, as shown in the figure.